There are at least three accounts of the event, which occurred in 1864, three years before Nebraska became a state and only six years after the settlement of what one pioneer called "Table Rock City." It was "the" hanging of the horse thieves, because it occurred only once. 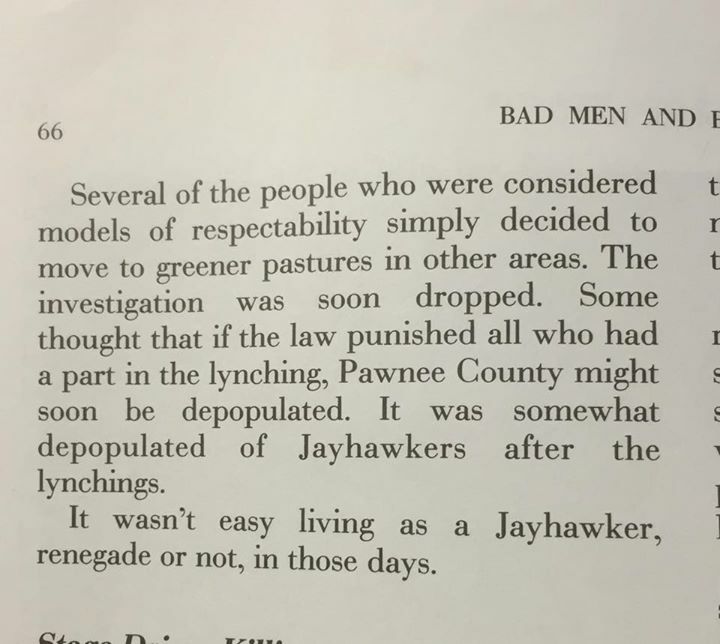 The grim statement is often made that it showed how intent Table Rock was in repelling the gangs coming up from Kansas. The best history of the event to survive was published in an 1894 edition of the Argus. While a later 1900 recounting of the event is often quoted from, the 1894 recounting is far more vivid, filled with far more detail. However, this amazing history is incomplete. It was published in installments, and only the editions of the Argus with the first three installments have survived. The probably was just one more. These three surviving installments are so worth the read. It gives a really good explanation of the historical context, just how bad horse thieving was in general but also this particular ring. And it offer little details that bring history to life. For example, the decision whether to hang the thieves was hotly debated, and a vote was taken. To make the vote clear, there was no parliamentary "all in favor, vote yay" or even a raising of hands. To vote, the men had to get in a line, thereby fully committing themselves. There were 115 men, and about 75% of them got in the line in favor of the hanging. 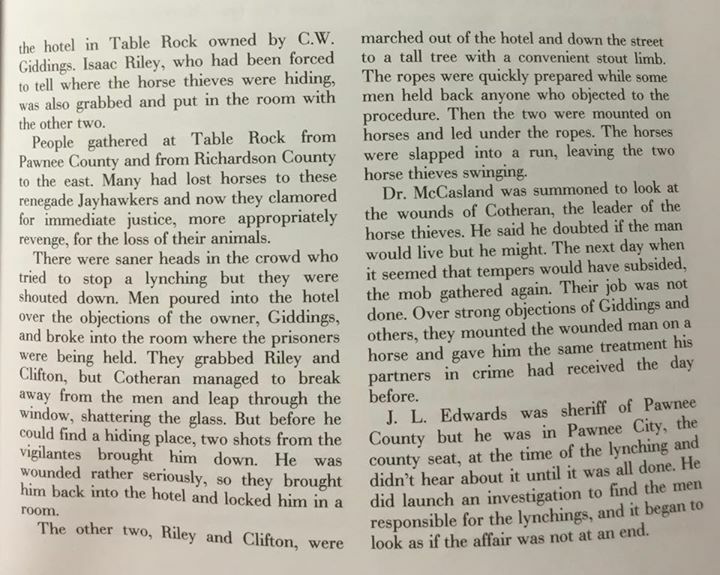 The story in a 1900 article: The lynching of three horse thieves plus a man who had helped one of them after he had been shot, was included in a history of Table Rock called The Disagreeable Landmark. From the book Bad Men and Bad Towns. Thanks to Kim Vrtiska for finding this! In the mid 1800's there was a small village on the Nemaha River by the name of Cincinnati. It was located south of DuBois. The Nemaha was damned up there with a small grist mill operating on the the damned up river. There remains a concrete slab in the river where it once resided. 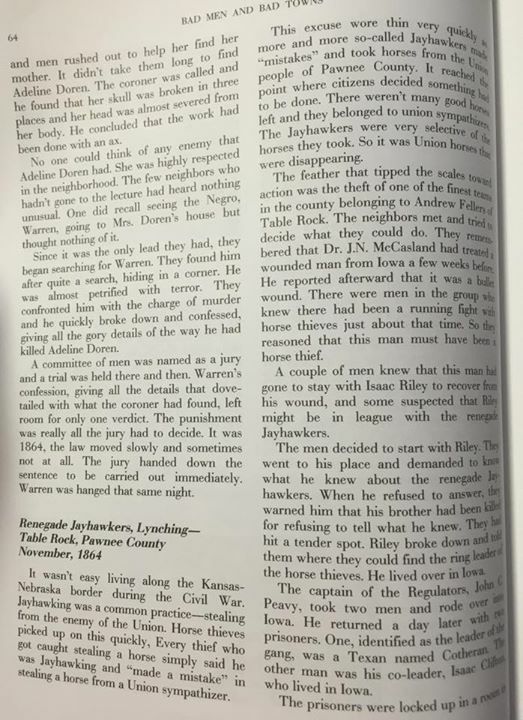 During that time, it was reported to the citizens of Cincinnati there were two horse thieves coming north from Bern, Kansas. In fact the two did arrive in Cincinnati during winter after the pond was frozen over. The residents of Cincinnati took them into custody, chopped a hole in the ice and the two were "asked" to take a brief swim through the hole in ice. The residents were asked about the exact whereabouts of the two and no one could remember.. But all knew.